Kevin Roberts. Much maligned man? Complete Genius? Or massive advertising charlatan who is peddling old ideas from the 80s? Well, if you read these articles, you’d be forgiven for thinking that yes, his theories are a bit overstretched. However, I’ve found a little defence for his argument here. Let’s consider the penultimate line for a moment. 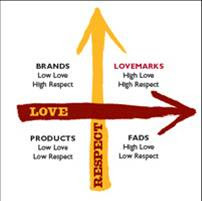 ‘You don’t just buy lovemarks, you embrace them passionately’. Barring people queueing round the clock for the sales or the latest games console, I can’t say I’ve ever seen this happening. Much as I love my adidas trainers, I don’t hug them or call them a special name. However, there is a simplistic truth to all of that. There are certain brands that people would buy ahead of anything else. But again, there’s a limit to how far that can be pushed. What stops me from agreeing from Kevin’s thesis is simply that I don’t believe that people value brands highly enough to make them Lovemarks. Russell Davies made the point very eloquently when he compared brands to a small figurine (the link is a download) – simply put, people don’t value brands on anything like the same levels Kevin thinks they do. Moreover, people are fickle – what he describes as a Lovemark can easily become a fad quickly. People respect people – they don’t respect brands in the same way. It’s ALWAYS going to be a fad, and the only way it commands a repeat showing is by it living up to the image the communication or perception has generated. So no, I don’t agree that the future is Lovemarks. Parts of the concept are interesting (if a little obvious, but that’s about it). 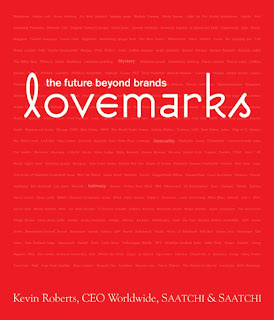 Mind you, it poses an interesting question; if people can be brands now, can THEY be what Kevin describes as Lovemarks? Thanks for the vote Will. Good man.